Bad news for anyone who loves subscription fees: you won't need a PlayStation Plus account to play The Elder Scrolls Online on PS4, Bethesda says. You need Sony's premium service to play most PS4 games online, but Bethesda's upcoming MMORPG (out in April for PC/Mac and June for PS4/Xbox One) will be an exception, because it's got a subscription fee of its own. Posting on the PlayStation Blog this morning, The Elder Scrolls Online director Matt Firor dropped the news. 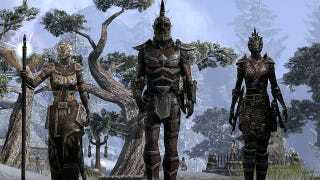 "A PlayStation Plus membership is not required to play The Elder Scrolls Online," Firor writes. "PS4 players will only be required to pay the same monthly subscription associated with The Elder Scrolls Online that PC and Mac users will pay—nothing more." Also, PS4 players will be on a different server than PC/Mac players. No word on Xbox One/Xbox Live just yet.